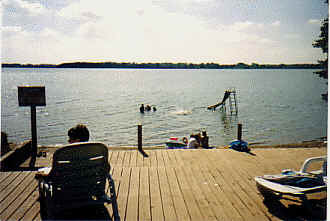 Let's cool off in the lake! 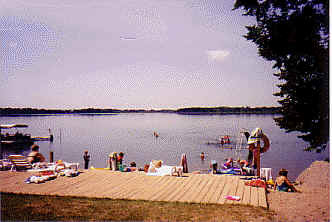 Some of the best memories of going to the lake are of swimming at the beach. 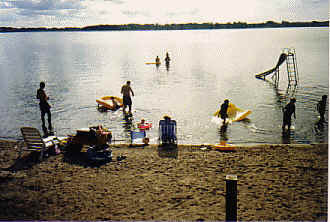 Our beach is nice and sandy perfect for the beach toys or a cooling swim. The lake very gradually gets deeper without any drop-offs. The maximum depth in the beach area is about 4-5 feet and is very clean and clear. 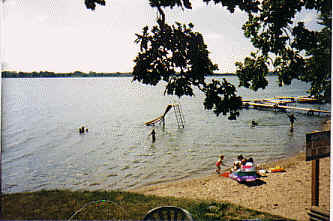 We have a slide in the shallow part of the beach so the kids can enjoy it without going out too far and a swim raft a little further out for older kids to enjoy. For those that want just lay in the sun, we have a sun deck that overlooks the beach. We provide a limited number of lounge chairs to relax in. The further you go out from shore the rockier it gets. 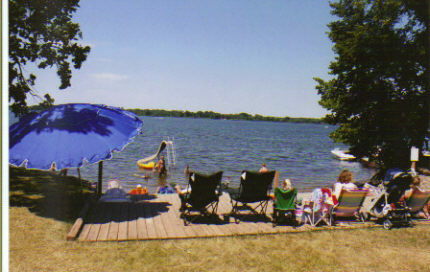 Many guests like to wear water shoes.